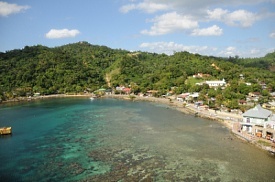 Floating 30 miles off the Caribbean coastline of Honduras, in the Bay Islands, Roatan is 29 miles long and two miles wide. Reefs surrounding the islands are teeming with marine life and offer some fantastic scuba-diving and snorkeling opportunities. Idyllic beaches also lure visitors.